March 9, 2015 + + + The first of three science symposia being held by BASF in the year of its 150th anniversary will be held today and tomorrow in Ludwigshafen. More than 600 top ranking scientists from academia and business will be discussing the entire bandwidth of the title topic “Smart Energy for a Sustainable Future”. About 40 speakers will be discussing innovative options for the storage and sustainable use of energy and explaining approaches to energy-efficient chemical production. Other topics include viable future mobility, new materials for energy technologies and future energy supply. The symposium is part of the worldwide Creator Space™ program in BASF’s anniversary year. About one third of the high-caliber researchers are coming from within the company itself, and two thirds from the world of academia and other cooperation partners. 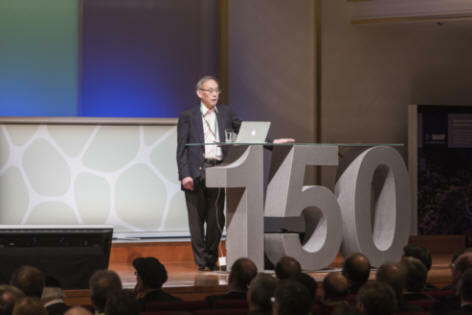 Nobel Prize winner Professor Steven Chu of Stanford University has entitled his plenary lecture “The energy, climate change and how to transition to a sustainable world”. For this ambitious topic, he can also draw on his extensive political experience as United States Secretary of Energy between 2009 and 2013. Based on his assessment of the risks of climate change, Professor Chu will discuss options to mitigate those risks by technical progress. An innovative solution for sustainable energy use will be presented by Professor Ekkes Brück of Delft University of Technology, who will be talking about magnetocaloric materials for energy-efficient heat pumps. The prototype of a cooling system using this innovative technology was just presented by BASF, Haier and Astronautics in January of this year. Besides the ongoing conference in Ludwigshafen on the topic of smart energy, in the anniversary year 2015, two further science symposia will be held in other parts of the world. In Chicago, the subject of sustainable food chain will be under discussion on June 23 and 24, and in Shanghai the future of urban living on November 9 and 10. The global Creator Space™ program of BASF offers high profile scientists from around the world the opportunity to exchange their knowledge of these three central anniversary themes. The symposia thereby represent special highlights in the long series of co-creation activities through which the company networks people and ideas around the globe with the aim of jointly developing new solutions to global challenges.